What Is The Best Soundtrack / Musical Score Album of All Time? What is the Best Soundtrack / Musical Score of All Time? I kept the List relatively short as there are just way too many different Albums from Movies, TV and even Video Games to pick from. That's why you have the 'Other (Leave Comment)' option for anything else that is not on the list. Feel free to post all Soundtrack / Musical Score albums in this thread. Off the top of my head, I know I've cobbled together all the tracks from all the Godfather movies. I don't listen to them much, but they are engrained in my head so much, I can hear the songs now. 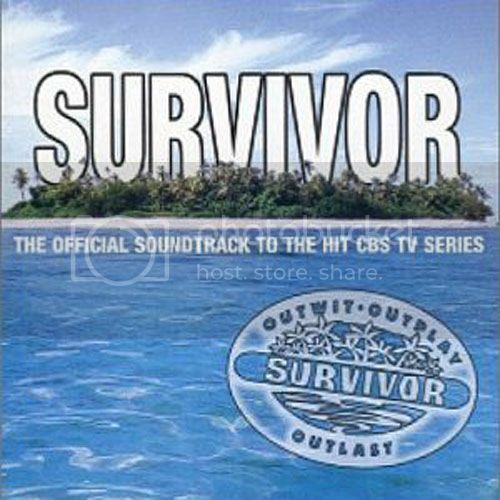 I'm currently in the middle of watching my Survivor DVD Marathon and once again, the music from the show invades my brain to the point where that's all I can hum for days. So, I might as well feed the addiction and bust out the Season 1 CD. I think it's a crime that not many people talk about the music as it seems like it's viewed as an afterthought, which is a shame because the music really is the star of the show. Having said that, this album is far from perfect. There are a couple of stinkers that do not belong here and would have been better served to remain in the dust bin. There are a couple of songs that absolutely rock and those are Ancient Voices, better known as the Theme Song and Tally The Vote, which they play during Tribal Council. I could listen to both of these songs forever. I think I will just play these on a loop for the rest of the day. I feel VERY tribal today!! Ha. I for the most part have not singled out soundtrack music. And I'm talking about the orchestral stuff. While its beautiful and a major player in the film, I've never sat down to listen to a soundtrack. 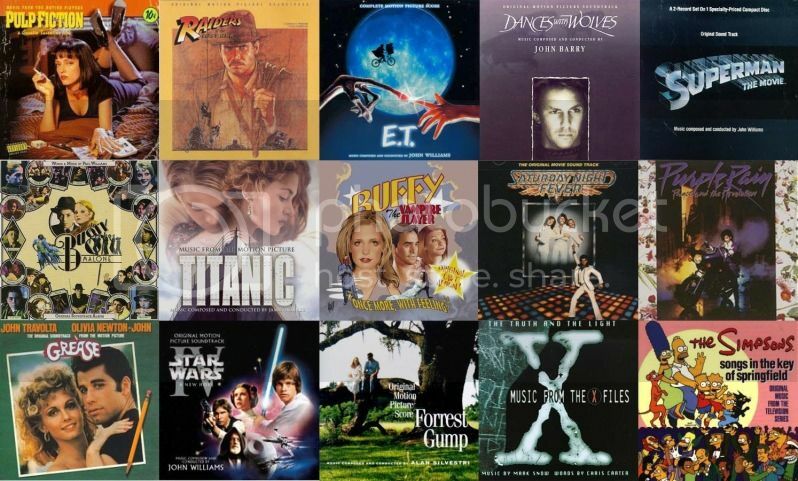 You never bought a John Williams score for any number of movies (Star Wars, Indy, ET, etc....)? Hell man, if I loved the movie...like it was one of those out of body type experiences, usually the music/score was a big part of that experience and I would head straight to the record store once I exited the theater to grab me my copy. This is my most prized Vinyl because of the lengths I went to get me a copy. Long story short, it took me years to find a copy from the last time I saw it in a record store, around 1980-81 (this was long before there was an eBay). Anyway, I finally found a copy at the San Diego Comic Con in 1996. One guy wanted 120 bucks for a mint condition in its factory seal wrap. Another vendor had it for 45 bucks a few booths down. I picked that one up instead. Love the movie. Love the music even more. 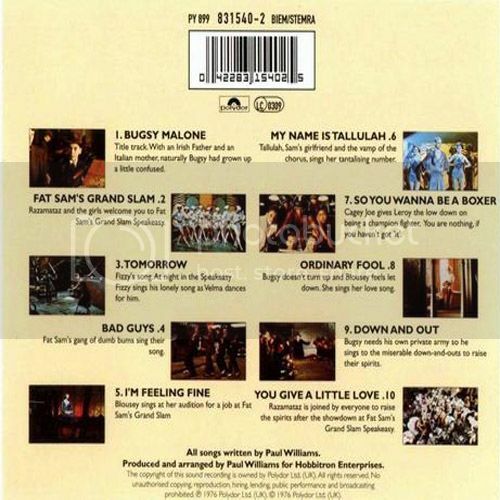 For those that don't know, music and lyrics are by Paul Williams. If you don't know who he is, go and watch Smokey And The Bandit. He is Little Enos. Contrary to popular legend regarding the music, the kids do not sing on this, nor do they do in the movie. The actual performers are Paul Williams, Archie Hahn, Julie McWirder, and Liberty Williams. I will admit that when I saw this movie when it was in the theater, I did think that Scott Baio, Jodie Foster and all the other kids in the movie were actually singing, as in it was their actual voices I was hearing. I just thought they had the incredible ability to alter and change their pitch to make themselves sound a bit older. Hey, I was just a tiny kid and didn't know any better. Cut me some slack!!! Fave Songs: All of 'em. There isn't one song I can do without. Need 'em all. 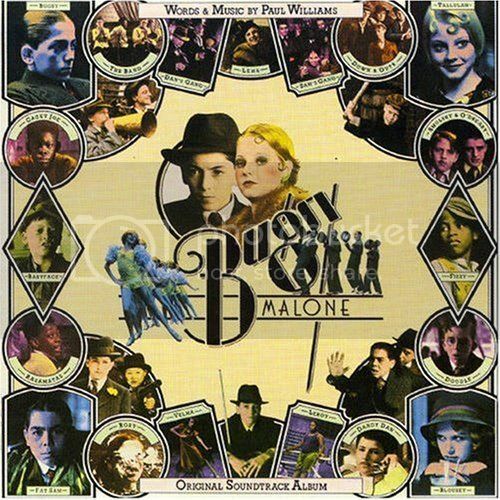 Okay, now if I had to choose, like gun to head, I guess I would say Bugsy Malone, Bad Guys, Down and Out and Good Guys/Give A Little Love. Bah! I can't exclude the others! So, I gotta add Fat Sam's Grand Slam, Tomorrow, I'm Feelin' Fine, My Name Is Tallulah. So You Wanna Be A Boxer and Ordinary Fool. awesome movie and soundtrack....they should show this movie every year on Thanksgiving ....like they do with Christmas Story. I think this movie is something any kid would love. I'd give it as many stars as you'd allow! It's too violent for Thanksgiving. It would be better on Xmas! Pie in the face for the win!! 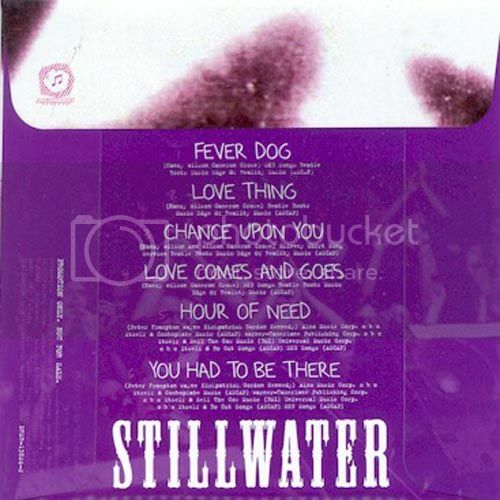 I remember the first time I saw Stillwater live at the San Diego Sports Arena opening up for Black Sabbath. They were un-f*cking-believable in how good the songs where and how they just absolutely owned the crowd that night. 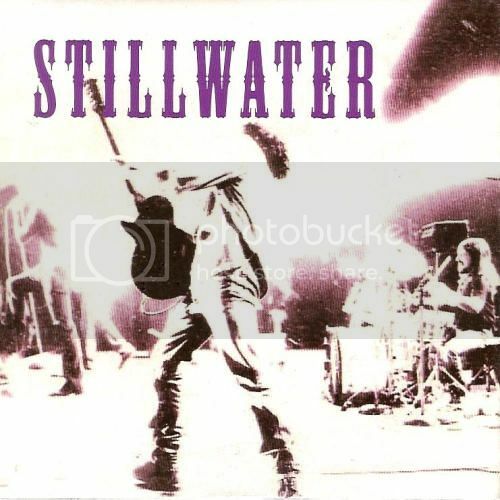 Now, I had heard of Stillwater prior to going to see them that night, but I hadn't really invested any time into learning about the band or their music. That all changed that night, watching them Live. I became an immediate fan and I even tried to sneak backstage to see if I could meet Russell Hammond, who I considered to be a far superior guitar player than Jimmy Page and I also wanted to meet Jeff Bebe because I thought he had an amazing voice, one of the best ever. Robert Plant? I don't think so. What ended up happening is that I met some chick. Can't remember her name, I believe it was Penny. Maybe she's the reason why I named the forum 'Penny Can', as in 'Penny can call me whenever she wants......'. Anyway, we got to talking about Stillwater when I discovered that she was a Band Aid. I got scared and ran away, bumping into some kid with a notepad or something. He was a d i c k . He didn't even apologize to me at all. What a d o u c h e !! Long story short, I've been a fan of Stillwater since that day and scared of groupies, er....I mean Band Aids since that day as well. You can check out my review of the actual show over in the Almost Famous: Untitled thread. Ha. All jokes aside, I do love fake bands that are in movies and this one is one of the best ever in creating a fictional band. But unlike a lot of fake band / movies, the music absolutely ROCKS on its own merit. I can easily put this Stillwater EP up against anything by "legit" bands and singers being put out over the last 20 years. No lie. Great songs and great musicanship. Fave Songs: All of 'em. But my top 2 picks go to Hour Of Need and Love Comes And Goes. Amazing songs!!!! Loooooooooove them both. Ok, now you've sparked my interest. I'm not even sure we heard this band in the mid-west. If you've seen the movie Almost Famous, ya already heard 'em. Not to be confused with another band of the same name. Black Sabbath on the other hand...FAKE!! !